Glutting was born in Newark in 1910. She graduated from the Beard School (now Morristown-Beard School) in 1927. Playing out of Rock Spring Club, she was the first to win the state Women’s Amateur Championship four times (1931, 1932, 1934, 1935). 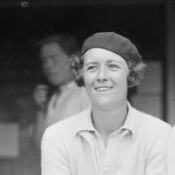 Glutting captured the decisive point of the 1934 Curtis Cup to lead the American team to victory. In 1938, she led the U.S. team to its fourth consecutive Curtis Cup victory at the tournament. Glutting captured numerous prestigious championships, including the 1934 North and South Women's Amateur played at Pinehurst Resort. In 1935, she reached the semifinal of the U.S. Women's Amateur.